Napoleon Bonaparte McClain with his wife Angeline P. Harrison. 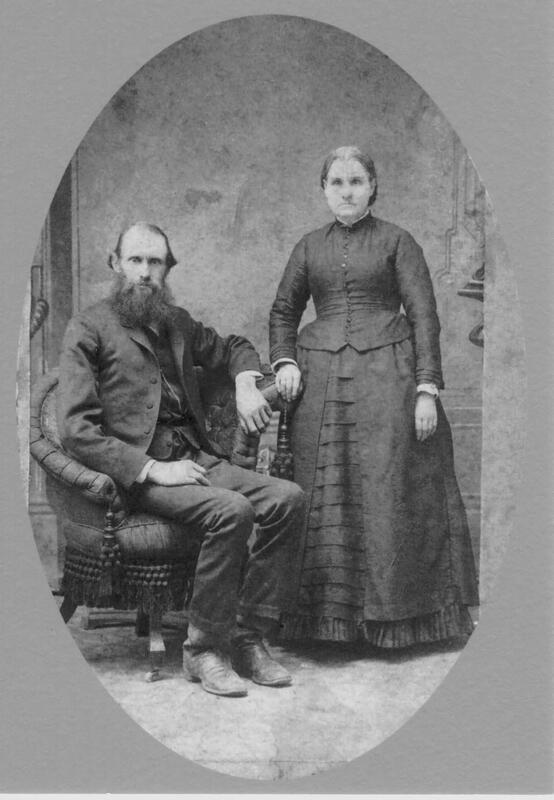 They married in 1861 two years before he joined the Union Army. In an armed conflict during the war he lost part of his hand and a finger. As a family historian I have come across my share of unusual names which seem to follow certain traditions. For example, Biblical names seemed to be popular with my paternal family line in the 18th and 19th centuries. Manurvia appears several times in my maternal line and I have stumbled across Permelia in my wife’s linage. When I read some of the names, though, I am reminded of the Seinfeld episode where George reveals the two perfect names (Soda and Seven) — one he offers up to his fiance’s friends. When they balk saying Soda doesn’t seem like a name. He responds. “Do you think Blanche sounded good the first time people heard it?” he asks. Here are a list of a the most unique names I have found so far. I don’t know exactly what it means when you give your child the exact same name of a well-known person other than an obvious endorsement of that individual. It does beg the question, though, what if during the child’s life their namesake becomes disliked or dishonored. In my wife’s lineage — a distant grandfather — is named Napoleon Bonaparte McClain. Since the real Napoleon died in 1821 –and Napoleon Bonaparte McClain was born in 1839, he was at least free from the possibility of any real-time life scandals involving his namesake. In my wife’s lineage there is also a Christopher Columbus born in the late 1800s. In my maternal line I have a distant grandfather who lived in northern Tennessee named Alexander Beaty — whose father Andrew was one of the Overmountain men during the American Revolutionary War. Alexander was very patriotic when it came to his children — naming one James Knox Polk and another Andrew Jackson. Andrew Jackson, along with his brother Thomas and brother-in-law Andrew Owens would die young, having the misfortune of being captured during the U.S. Civil War. All three men died in Confederate POW camps. In the Claywell line, there are multiple instances of Shadrach — and even a Meshach and Abednego. Peter, Solomon (sorry not Paul) and Mary were also common in the Claywell lineage. In my maternal line there is a Sarah Magdalene (instead of Mary), and a Moses or two. A couple of the most unusual names I have found are Spotswood (male) and Telitha. Telitha is my maternal grandfather’s mother. I looked up her name — which can also be spelled Talitha, I think — it is a Biblical name. Apparently it is mentioned in the Gospel of Mark. Two names that feel more like verbs than proper nouns are Comfort Claywell, born in the 1680s in the U.S. and Obedience Claywell listed in the 1860 in Cumberland County, Kentucky where my father grew up. But, so far, I think the most unique name I have come across, in my opinion, is America Claywell, born in 1858 in Cumberland County, Kentucky.